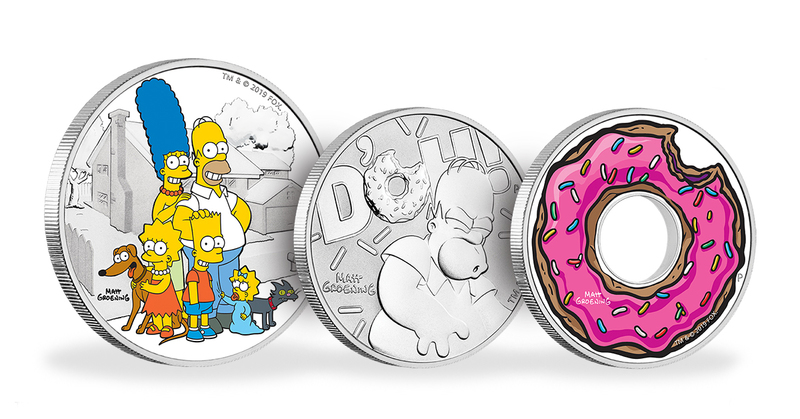 The Perth Mint has issued a set of coins dedicated to the popular cartoon TV series The Simpsons, including a 'donut'-shaped coin with the centre stamped out. 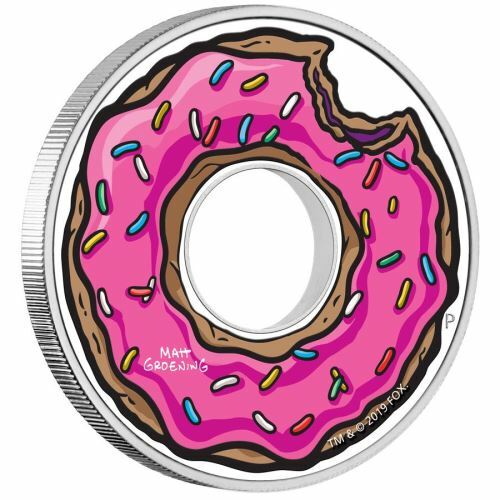 The Simpsons series consists of eight 1oz coins and one 2oz coin struck from 99.99% pure silver, with each limited edition release depicting a character or motif from the popular television series. The first three coins in the set were unveiled at the 47th World Money Fair in Berlin, Germany to a global audience of minting organisations, coin distributors, collectors and gift buyers. 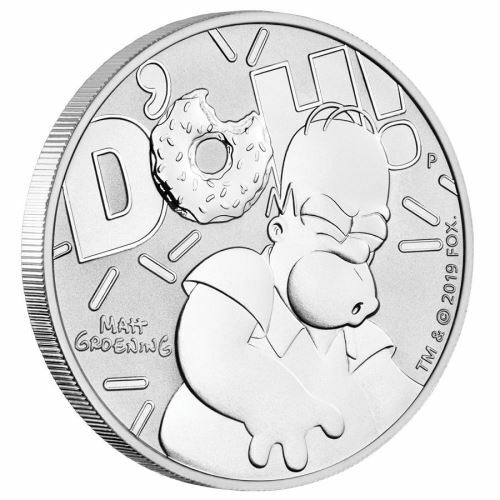 The one bullion coin features the word “D’OH!” above Homer Simpson in his iconic catchphrase pose. A half-eaten glazed donut with sprinkles, Homer’s favourite treat, replaces the letter O in D’OH. “It is themes and innovations like this which bring new life and conversations to the world of traditional bullion coins and modern investment options." The coins are already being sold on eBay, see a selection here. 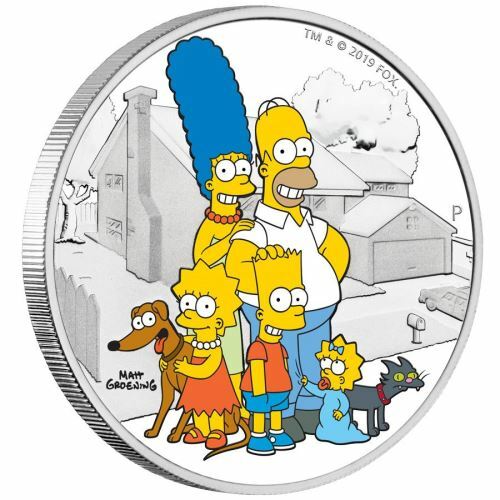 Of the other two inaugural releases, one coin features The Simpsons, along with their family pets Santa’s Little Helper and Snowball II, in front of their family home in Springfield. The other collectable pays tribute to Homer’s favourite donut complete with the centre stamped out for an authentic donut design. Completing the series in the coming months, the remaining coins will feature Marge, Bart, Lisa, Maggie and a Duff Beer can. Mr Vance said the program was the latest example of The Perth Mint creating new markets for coins and Australian precious metals. 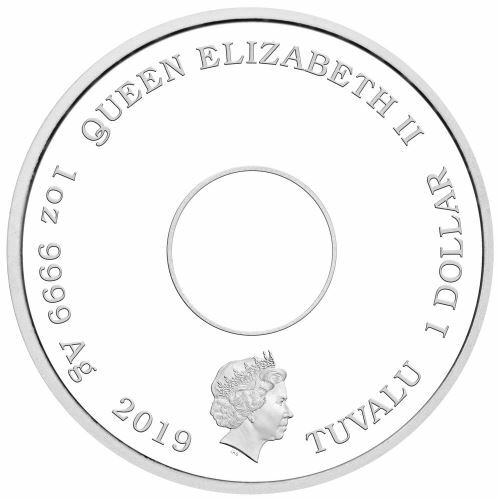 The coins have been produced by Perth Mint on behalf of Tuvalu.